MOOCs (Massive Open Online Course) have been widely publicized as a new learning model that could impact the future of higher education. While the field is rapidly evolving, and the implications for institutions are unclear, it is undeniable that they are a disruptive innovation that could have a lasting effect on the industry. Want the short version? Check out the Scribd “MOOCs, The Snapshot Version” below, or download your own copy from Google Drive HERE. Check out information on the project here. Interested in checking it out for yourself? Look for the CCC MOOC on CourseSites. 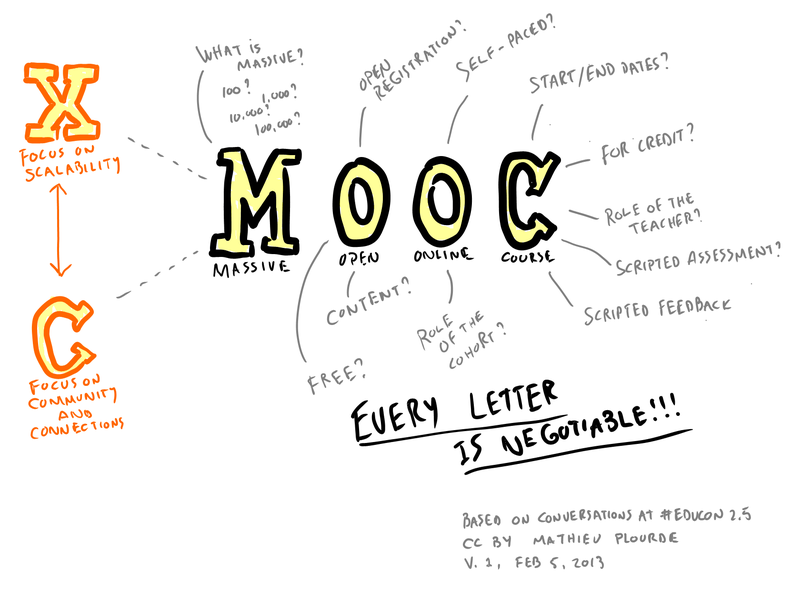 Find MOOC model-related resources and info below. Interested in facilitating an xMOOC? Check out this now dated (insert throat clearing here) video explaining MOOC by one of the originals that coined the word. What he is describing is now commonly referred to as a cMOOC – a constructivist, networked, highly participatory MOOC. This really explains a cMOOC (based on connectivism rather than traditional learning).